A very simple part, that hasn't changed at all since its introduction in 1919. Apart from a brief period when eight were supplied in the largest outfit 7, these have also been sadly lacking in most Meccano outfits. They are very useful for creating internal threaded holes where it would not normally be possible to add a nut to a bolt, for example when joining angle girders together into box sections for strength. In the dealer's spare parts lists, these parts are always shown with a bolt (part 37b). In the photographs on this page, the bosses are shown without bolts for clarity. The threaded boss has not changed shape since its introduction. The only way of dating the parts is by the stampings on early versions. Although these parts are obviously all pre-war, it is not certain exactly what dates these stampings refer to. In the photo to the left, you can see versions stamped Meccano Reg.No.671534 on the left, and then the fully stamped Fabrique En Angleterre Meccano Reg.No.671534 with the German patent number D.R.G.M. 801.040 at the bottom. DRGM is the pre-war marking for a German registered design. 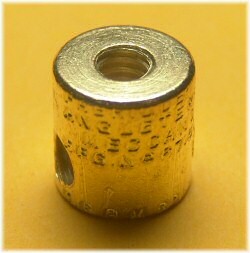 The third example is stamped just Meccano in wide-faced type, and the fourth is stamped on the end face in the same way as some collars are. Of course, the FEA marking dates the part from between 1921 to around 1929ish. I believe that the wider Meccano stamping alone is later, perhaps 1930's? It's also possible that there exists a version with a smaller typeface Meccano stamping, which may be early 20's, but I haven't seen an example of that. As you can see from the four versions above, some threaded bosses have chamfered edges and some don't. It remains to be seen whether we can distinguish these as specific versions of the threaded boss. I very much doubt it as most stamping variations can be found both with and without these, so it's more likely just a manufacturing variation perhaps from different machines. Similarly, some parts are found with a deep recess on one face in addition to the thread (as with the extreme left and right-hand examples above), but there doesn't seem to be a pattern to this either. I think they were always double tapped. This is the same as the threaded crank, part 62a. Look at the crank page on here to see. Is there any information regarding single versus double tapping? I believe part number 64 was originally a tubular piece that could be forced over 1" pulleys to form a ships funnel. It was called a funnel in the 1914 parts list and used in the naval ship models like model 111 in the 1914 manual. Thanks for this info, Gents. I've just purchased a number of this Part. The picture appears to show variation in the position of the transverse tapped bore. EMP shows this as being 1/8" from one end, but most examples I have seem to be more like 5/32. Are there specific variants in the position of this hole?